In light of recent bad press, what, if anything, should Uber do to clean up their brand image and regain trust from the public? Uber needs fixing and they need to show the public the measures they are willing to take to protect their customers. They need to put into action strict measures and guidelines, for example: third-party background checks, suspension and review of drivers with a spotty record, and dedicated customer services. They need to show their riders that they are serious about safety and put these protections in place. Uber clearly is a hot brand with an in-demand product – it’s practically become ubiquitous for traveling in New York City. The recent bad press, not to mention a satirical look from the writers at South Park, proves that Uber needs to commit to keeping their consumers safe and comfortable. The Uber team needs to publically promote a rigorous training and background check on each and every driver they employ, as well as a clear algorithm behind their pricing methods. If that means having fewer drivers in the interim, it’s worth the price of regaining consumer trust. it is hard to ignore all of the negative attention Uber receives. Uber needs to be more responsive to the bad press that they’re getting. Ignoring it is not going to make it go away, and they need to be proactive in their public relation efforts by getting ahead of negative stories. They should sympathize with their customers when they are unhappy and realize that what the media is saying about them does matter. Their business may be doing fine now, but I think that the negativity will inevitably catch up to them. Be transparent – Many complaints from consumers are tied to being told that the ride would cost one amount and ultimately being charged astronomically more. Be reachable – Riders can’t seem to get through to customer service when they have a problem. This typically leads to consumers airing their grievances in much more public forums. Take Action – With the most recent claim that a rider was kidnapped, it’s shocking that the customer service tried to convince her otherwise. Are you kidding? Take this feedback seriously and take the appropriate legal actions. For now, I’ll stick with cabs. Uber has been in hot water, it seems, since their dawn of time. Unless they conduct a serious overhaul, one of these times will be the last straw for their customers. I already have friends deleting the app and complaining about bad service or being afraid—especially when using UberX. While they do have a great business model, my advice would be to stop the expansion for now and focus on their existing customer base. A heartfelt apology from a high up exec and the promise of some driver training and more extensive screening would probably be the best way to gain back rider trust. It would certainly put me more at ease about requesting a black car instead of hailing a Yellow Cab. New business is the life blood of any agency but so are those large-scale retainer accounts that back in the day, paid agencies a straight 15 percent fee. 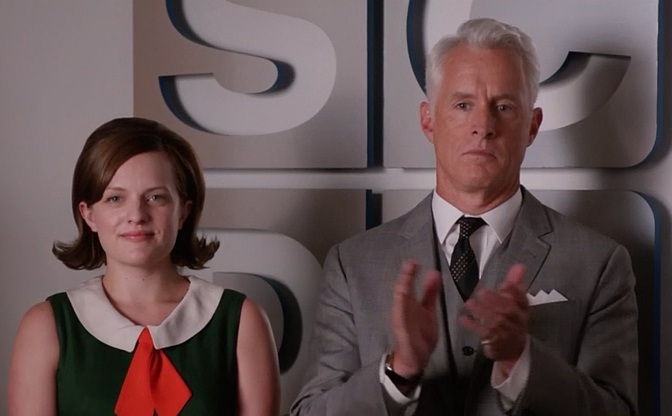 Since Sterling Cooper Draper Pryce lost Lucky Strike, it’s been a free-for-all in trying to find that next great account. Usually one to squash a client’s idea, Don instead agreed to investigate the possibility of securing the band. After a failed backstage ambush at a Stones concert inNew York, Don and Harry drown their sorrows (and Harry’s medicated munchies) in fried food. Interesting fun fact: The idea wasn’t too much of a stretch as the group created a jingle for Rice Krispies back in 1963. Teaming bands and brands isn’t a crazy concept anymore. In fact, it’s everywhere these days, and seeing this strategy in its nascent stages is part of what makes this episode so fascinating. Artists have exclusive and dedicated audiences. They have the power to unite people of all ages and demographics and create evangelists. Artists are their own brands. But if used strategically, they can help raise another brand’s profile. Live Nation has mastered this concept by partnering popular artists with brands that resonate with their fan bases. Using data analytics, Live Nation was able to determine tendencies of fans for particular artists. For example, some of their integrated marketing programs include those for Beyonce and Citi; Thirty Seconds to Mars and HP; and Hertz and Fitz and the Tantrums. Today, though, it’s about more than just a 30-second ad featuring a big-name act. A smart marketing program engages music lovers at every brand touch point – before, during and after the show, on Twitter, Facebook, mobile apps, and via VIP events at the venue. What Live Nation, Translation and others know to be the golden rule of branded partnerships, is that the star brand has to be a fit for the corporate brand. If there isn’t an authentic connection between the two, you’re left with disappointed fans, celebs and marketers. So even though the Stones weren’t right for Heinz beans, it doesn’t mean that there isn’t another band out there that would do the trick. Perhaps in next week’s episode the Beach Boys will make a cameo appearance. Unless they’re way down in Kokomo.